Hi everyone!. 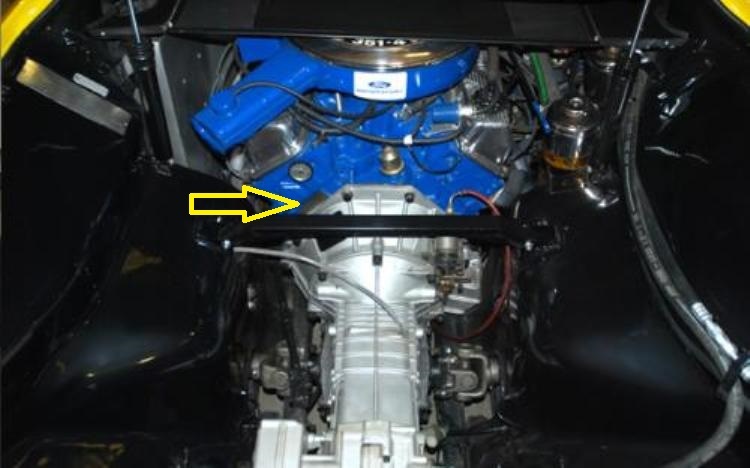 What is the original manifold/carb combo (parts number) for a `72 Pantera? Ford carb, and a cast iron manifold. But as you have been informed other options were available from the Factory. Part numbers would be appreciated. I want a 100% original period correct car. I`m a bit finicky on this one. North American Panteras utilized the Motorcraft 4300D spread bore carburetor. There were two versions of the cast iron spread bore intake manifold designed for that carburetor, having casting numbers beginning D1ZE or D3ZE. The D3ZE manifold had a big trench running along side the carburetor mounting pad for exhaust gas recirculation. Your 1972 engine would have been equipped with the first version with a casting number beginning D1ZE (no trench). Over in Europe I believe De Tomaso fitted the engines with 650 CFM Holley double pumper carburetors, Holley list number 4777. This was a much better carburetor. To install the Holley carburetor De Tomaso modified the spread bore intake manifold (elongated the large secondary butterfly holes) to allow the "square bore" Holley carburetor to fit. Thank you George. Cross referencing with the Mustang people their 1972 CJ engines apparently had a D2ZE-9424AA. The 2 after the "D" meaning 1972. Does that ring a bell with you? The information about the Holleys in Europe is new to me. Have you got any references that I can show the inspectors when I take #2471 through the vehicle inspection? They are picky about these things. You guys don`t know how lucky you are. 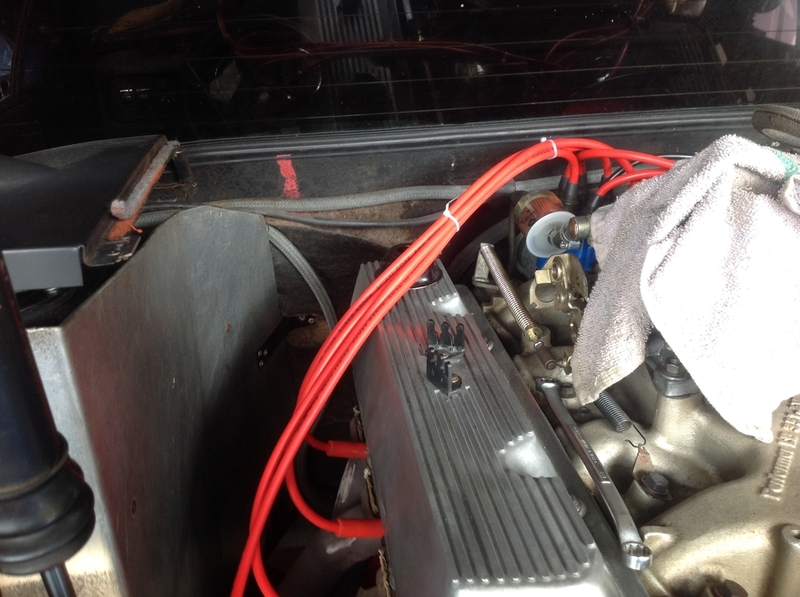 The push button Panteras had aluminum Ford manifolds and 600 cfm Holley carburetors. The GTS Panteras had the list 4777 Holley carburetors. Your car apparently falls in between so I cannot say for sure if De Tomaso would have replaced the carburetor. Some of the other European owners need to chime-in and tell us what they've seen. D2ZE is an engine part for 1972 mustangs. In Ford numbering the "D" stands for the decade of the 1970s, the "2" narrows it down to 1972. 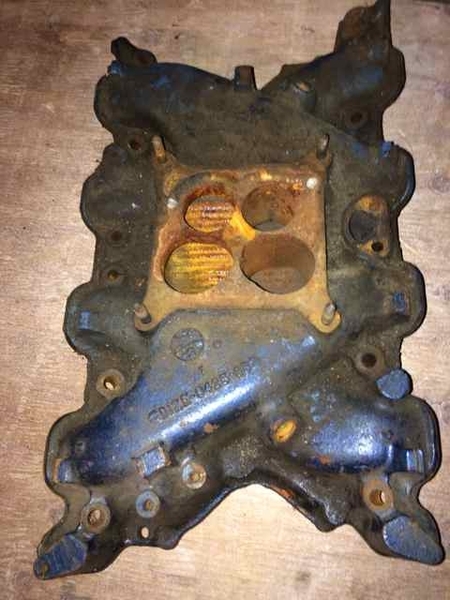 If it were me I would install the Square bore cast iron manifold, casting number beginning D0AE and a Autolite 4300A "square bore" style carburetor. I can't believe a German inspector will know the difference between 1970/1971 factory parts and 1972 factory parts. The carburetors and manifolds all look the same. Once the car is inspected I'd remove the Autolite carburetor, place it on a shelf, and install a Holley carburetor to replace it. Actually, I do realize how lucky I am. The picture below shows the carburetor mounting pad of the D3ZE intake manifold, with the big exhaust gas trench on the right hand side. This is a picture of a D1ZE intake manifold (no trench, otherwise identical to the D3ZE version). The manifolds in both pictures are from GTS Panteras. If you look closely at both pictures you'll see that the larger holes for the carburetor's secondary butterflies are not round, they are egg shaped. They have been elongated by De Tomaso to allow installation of a square bore Holley 4777 carburetor. You guys have knowledge beyond belief. Thanks for sharing. Just picking up this thread again. I have a copy of the GTS supplementary parts catalogue and as Boss Wrench says here and other places, a Holley carburetor, referred to in the catalogue as part number 213 is mentioned. However, I haven't seen any documents saying that it is a Holley 4777 650cfm double pumper. It would be great if someone could point me in the right direction for this evidance, because I would like to be able to show it to any inspectors in the future (as demands for original or period corrrect modifications slowly tighten) that may question what was available from the factory in period. 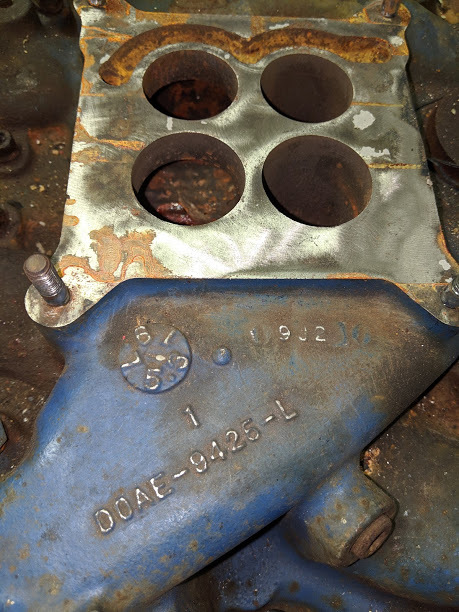 Great info and pictures on the intake manifolds George - it sure was a quick and dirty way of installing a square bore carb! The May 1974 issue of Road and Track magazine, page 48, quotes Peter Revson that the Holley carburetor installed in the GTS Pantera was part no. R4777AAA. There are a few other references in other books and periodicals, but the information which confirmed to me which carburetor was installed has been based upon testimonial provided by owners, right here via these forums. In the absence of a manufacturer that is in business, buyers, writers, businesses, and agencies are welcome to inquire with Pantera International for verification of various information. We provide such verification on a regular basis, mostly to assist owners in dealing with registration and inspection issues. I am however disappointed that neither Isabella nor Santiago considered this international club for keeping the production information, instead it was trusted to the keeping of a private individual in Switzerland ... who charges owners more than a nominal fee for copies of documentation ... much more than what Kevin Marti charges. 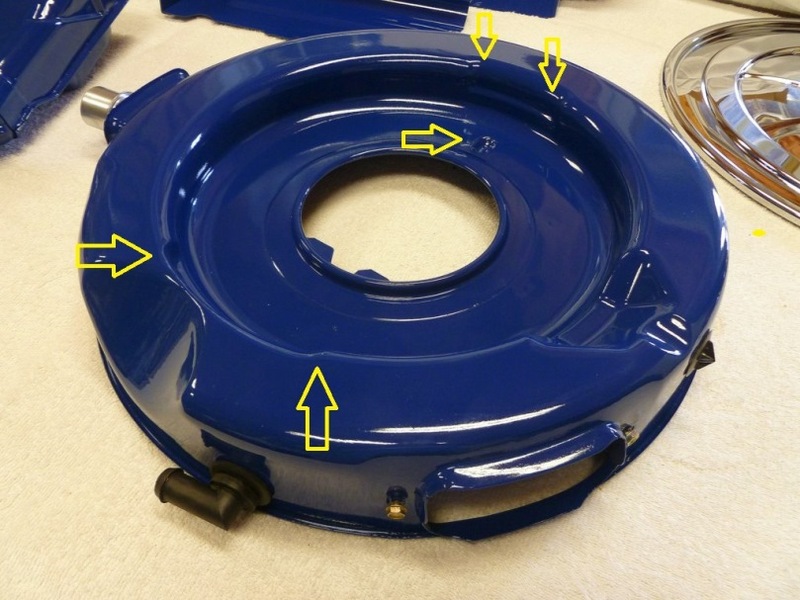 greatly appreciate your info and the reference for the part number. I totally agree with you that it would be a great service to the community if the documentation about these cars was more readily available. Hi, I am bringing this topic up again to ask what air cleaner was used from the factory with the Holley 4777 fitted to the Euro GTS and Gr3 Panteras? Was it the standard Ford Pantera aircleaner, or something else? I have what I think is the standard air cleaner, but it fouls on one end of the Holley where the nut is to adjust the floats - only on one end as the aircleaner is asymetrical, but I need an extra half inch or so extra between the holley and the bottom opening of the aircleaner to lift the air cleaner up sufficiently. I want a stock looking engine cleaner, not aftermarket. 5 1/8 inch diameter air cleaner spacers are another option. I have been struggling with the same manifold - carb question on 9193. As is it has a Holley 600 CFM list 9834, model 4160 mated to a aluminum manifold that says "Performer" on it. I don't think this combo is period correct but I suspect that at that time (1980 GTS + - ) the Tomaso people were installing anything they had laying around. Records on this car are scares at best. The Swiss fellow wants $60.00 to tell me what the original engine was. All he has. Not sure I want to pay that for what I think I know. The engine has never been out of the car. Do you guys think it's original and is spending the sixty worth it ? Think I'll have to sell the car due to California smog and registration laws so I would like to know what " original " is. Everything other than the carb and manifold appears to be stock and that's why I bought it. An original survivor that I want to keep that way. Thoughts ? I don't mean to hijack this thread. The De Tomaso organization did not operate hap hazard, installing anything they had laying around. The Australian engines (351C) were equipped with Motorcraft 4300A carburetors during the XA and XB Falcon era. Those were square bore caburetors, and therefore a Holley four barrel carburetor was a simple substitution. The engines built during the era of XC, XD, and XE Falcons were equipped with Carter Thermoquad carburetors, which were spread bore carburetors. The De Tomaso organization knew replacing the Carter carburetor with a Holley carburetor was worth about 100 horsepower. So I'm sure they replaced them. BUT I don't think the Carter Thermoquad bolt pattern was compatible with Holley carburetors. It wouldn't surprise me if the Australian cast iron spread bore intake manifold was replaced by an Edelbrock model 2750 performer 2V intake manifold, plus the usual Holley 4777 carburetor. But we've never really broached this subject before here on the forums. So at this point we need input from owners of Panteras built from about 1977 and later … would they please share with us what carburetors and manifolds were their Panteras (GTS, Grp 3, GT5, and GT5-S) originally equipped with. Keep in mind that cars brought into the US during the grey market era had to be DOT'd and EPA'd. Whatever carburetor they had in Europe would most likely have been replaced with something calibrated leaner here in the US. Kirk Evans is the hands down expert in this area. Fascinating info and no issues with hijacking - it is all contributing to the knowledge base. I don't have any experience with Panteras up in the 9000s, mine is 7217, so still Ford era. Is it correct to assume Panteras in the 9000s didn't have the usual tag on the chassis with the engine number and the number stamped into the engine? 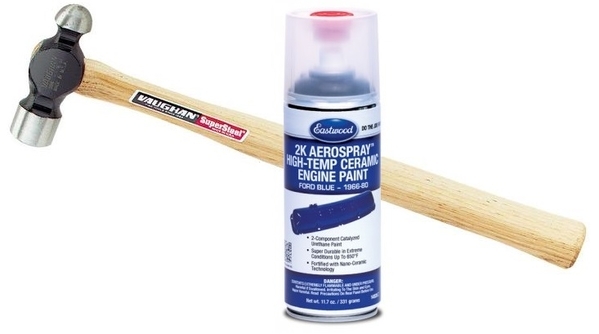 If your engine doesn't have a unique number stamped on it, then I guess that the paper work for 60 USD wont permit you to verify it is the original engine, but it may permit you to verify the opposite. Tim, Good reverse logic there. Where might this "tag on the chassis " be located ? My doubts on the correct man / carb. arise from two observations. First is that the fuel line from the pump is flared at the carb attach end. Yet I don't see a nut on the line anywhere. Strange ! The carb inlet fitting has a bead. There is no provision for a fuel filter. Second is the red ( high temp ) RTV squeeze out at the manifold parting surfaces. Also the electric choke feed wire appears to be home made. I have also been questioning the thermal vacuum switch on the water line off the thermostat housing for smog test / inspection requirments. There is absolutely no installed wiring or hoses for it. Brings up a question of being original. If no one knows what was original then how does one call the installation original ? For Ford era Panteras like mine, there is a number stamped on the engine block just below the head on the left hand side of the engine (visible with the heads on), when you are looking into the engine bay from the back of the car. But, as I mentioned, I don't know if all this is valid for a 9000 series Pantera, maybe someone else can answer that. Im glad Tim made a comment about infomation/highjacking. I have been following this thread. Do the Casting # support my assumptions? 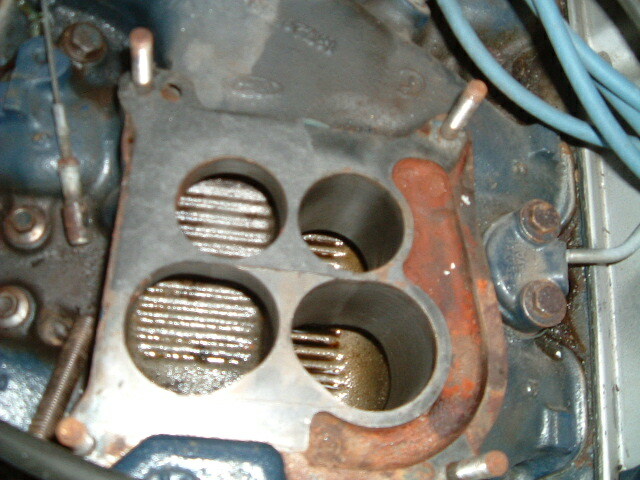 , this is the intake, carb and head combination that #2636 has. Would like verification; 1972 Ford De Tomaso Pantera #2636 Actual Build Date 02/72 ( per Marti Report). Original Cylinder Heads 4* DA D1ZE 4V open chamber ( end of head, large hand stamped 2 7008 - smaller hand stamped 5626 ) **Not sure what these hand stamped numbers mean if anything. some really interesting numbers on your engine parts. I am not knowledgable enough to say exacatly what they mean and if they are original to your car or not. So it is better that I let someone comment that does know what they are talking about. 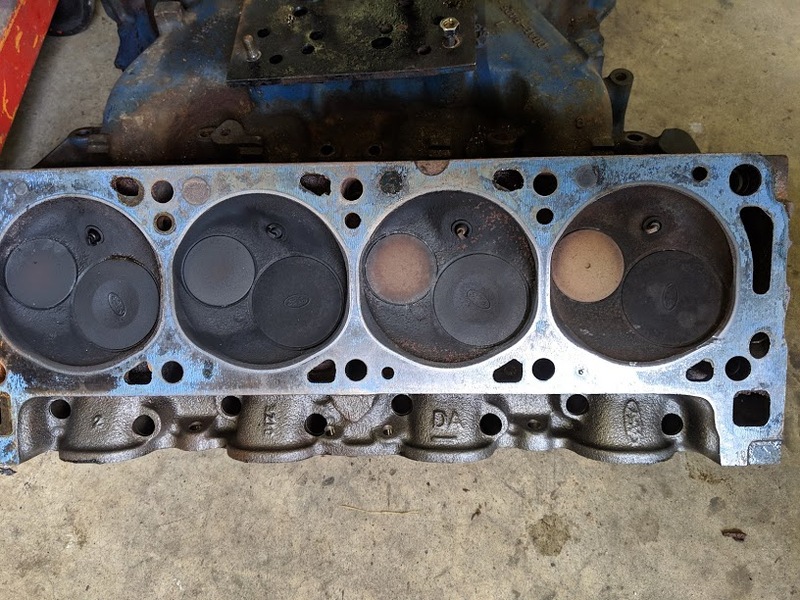 … Do the Casting # support my assumptions … 1972 Ford De Tomaso Pantera #2636 … Original Cylinder Heads 4* DA D1ZE 4V …. Original Engine Block D2AE-CA 2A31 … Non OE , Intake D0AE-9425-L Square bore ( 1970 ?) … Non OE Carb Holley Square bore Double pumper List- 4777-2 … All seem correct?? 2A31 = January 31, 1972 block's casting date. 9J2 = September 2, 1969 manifold's casting date. The 1972 Q code was rated 266 net SAE horsepower by Ford. The carb swap was worth at least 75 horsepower; i.e. 341 net SAE horsepower. Add 20 horsepower to those numbers for the Pantera installation to account for the lack of a power steering pump and for the De Tomaso exhaust; i.e. 286 → 361. I'm shooting for great driver @ 375-400 hp with 30 over and flat tops, slight bump in the cam (unsure about roller cam) and steel roller rockers ( something I can fit under the steel covers). Big bore headers and possibly mod/gut my extra mufflers (mothball my factory exhaust system) Still in the research process but, I like the look of the stock intake and bonus my stockish air cleaner should fit nicely. Previously bored 30 over and re-cammed with around 10k on it, sadly. I think he struggled ever since to get back low end power so he recammed it a second time after experimenting for several years. A good friend of mine said a few years back he took a Offenhauser intake off that had a terrible port match, that's when the 69 intake was installed. Not sure it was 100% even then. ≅375 to 400 net SAE horsepower can be achieved with a very stock engine. With D1ZE heads you'll need to compromise and consider using pop-up dome pistons. There are better headers than the big bore headers too. John Kaase was once asked what it took to make 400 bhp with a 351C, he replied "pull two plug wires". We can cover the topic when ever you wish privately or in public. Starting point: 1972 Pantera, ≅ 286 net SAE horsepower. Add square bore dual plane intake manifold (factory M code manifold is fine). Add a performance calibrated 650 or 750 cfm carb with annular boosters. The Cleveland has three known failure modes, even at baseline rpm levels two of them are worth taking steps to prevent from happening; and there are four recurrent problems which I also recommend taking steps to prevent from occurring. Thus there are six "universal" problem areas in terms of durability to be emended for all engines, all rev limits, all power levels, and all applications. 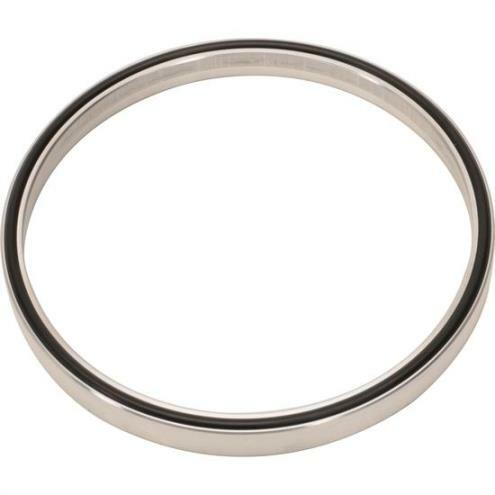 To summarize the durability emendations: (1) Valve Failure: Replace the factory valves, high quality steel valves utilizing OEM style loose fitting 4 bead locks are OK up to 6200 rpm; (2) Connecting Rod Failure: Replace the OEM connecting rod nuts with ARP p.n. 300-8381 nuts (2 nuts per pack x 8 packs); (3) Low Hot Oil Pressure: (3A) install tappet bore bushings with 0.060 inch orifices; (3B) install a high volume racing oil pan having baffles with hinged doors, a windage tray, and a scraper; (4) Connecting Rod Bearing Wear: (4A) install heavy duty (tri-metal) main bearings (Clevite #MS1010HG or #MS1010VG), fully grooved, with 0.0025 – 0.0032 clearances; (4B) use 10W30 Valvoline VR1 motor oil; (4C) install heavy duty rod bearings (Clevite #CB927) with 0.0022 – 0.0028 clearances; (4D) set the connecting rod side gap clearances at 0.018 – 0.022; (5) The Crankshaft Damper Ring's Position Shifts on the Hub: Replace the OEM crankshaft damper with a PowerBond p.n. PB1082SS high performance “fully bonded” steel damper; (6) Engine Over-Heating: (6A) install the correct Robertshaw 333 thermostat; (6B) insure the brass orifice is located in the block below the thermostat; (6C) insure that the recirculation passage within any Weiand or Milodon coolant pump is drilled out; and (6D) insure the head gaskets are oriented properly during assembly. If there are questions please express them. I am more than willing to explain the reasons behind these "decades old" recommendations. Spin Balance the Reciprocating Assy. Install a breakerless ignition (Duraspark recommended). Have the distributor calibrated with a performance advance curve. Aftermarket (or De Tomaso GTS) Tube Headers. Block exhaust heat from the int. manifold (annular boosters help here). This is the factory CJ cam ground with lobes providing 0.050 additional lift. TOTAL ≅ 440 net SAE horsepower at 6200 rpm. Equipped with 4V heads peak horsepower occurs at 6200 rpm with gross valve lift at 0.530". That’s right up against the base rev limit. So unless a person is willing to spend the money performing the high rpm durability improvements needed to safely raise the rev limit, it doesn't make sense to install a cam with more than about 0.530 lift. 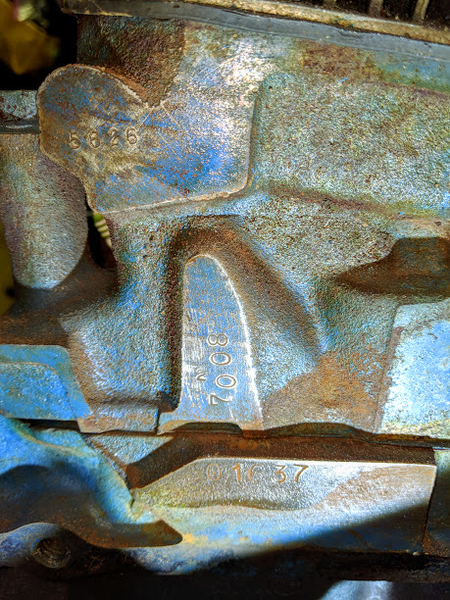 The factory rocker arms are known to cause accelerated valve guide wear when used with high lift cams. So 0.530 lift is a good limit for the factory rocker arms too. AND … with 0.530 lift a 351C 4V engine with a single 4bbl carburetor is capable of easily making 400 horsepower, and 440 is achievable (getting to 440 horsepower may require a bit more carburetor than 650 cfm). It just so happens that 440 bhp is pushing the limit of the factory fuel system to supply an adequate amount of fuel. 440 horsepower is also within the limits of the factory clutch. Engines making 440 horsepower, having no more than 7.8:1 dynamic compression, and rev-limited at 6200 rpm are in no danger of cracking cylinder walls either (as long as they are in good states of tune and their reciprocating assemblies are well balanced). So there's quite a point of convergence for 0.530 lift and 400 to perhaps 440 horsepower. The main ingredients are a performance tuned 650 (or 750?) cfm carburetor, a bump upwards in the compression ratio, a 0.530 lift short duration cam, valve springs, push rods, and exhaust improvements. With the right cam the engine can have good low rpm power, a nice muscle car burble in the exhaust, and be tame enough to drive to work daily. Not too shabby for 50 years old technology. From this point onward however the dollars multiply quickly. I was told my spare mufflers are GTS so GTS headers it is, I already upgraded the clutch, pressure plate ,slave and added a reduction kit, my ZF is safety wired and internally spotless. So 400+ shouldn't be an issue.